Mercer offers a well-designed, adjustable effluent weir plate with many advantages over traditional designs. The weir plate is designed to run the full width of the separator. This helps to minimize unwanted surges within the unit that are deleterious to efficient functioning of the separator. This is important when skim pipes are utilized or if flow rates may change in the future. If the skim pipes cannot be set properly because of excessive, unwanted surging, two scenarios can occur. Either, no oil will enter the oil-holding tank, and oil will continue building up in the OWS. This is due to the skim pipe being set too high. Or if the skim pipe is set too low and the peak flows within the separator create surges, then water will overflow and flood the oil-holding compartment. Well-designed weir plates are used within a separator to adjust the static and operating levels in order to "fine tune" these levels to further enhance and optimize performance both at start up and with future changes in flow rate. One important distinction that makes Mercer’s weir plates unique is that the bolts that seal the weir plates and gasket are close together--one can literally tighten the hardware by hand to hydraulically seal the weir system. This "easy adjust" design feature prevents deformation of the weir gasket. By preserving the gasket’s original shape, the weir plate can be easily adjusted to different heights in the future without the weir plate leaking due to a deformed gasket cause by over tightening. A deformed gasket can be problematic in making a positive seal when the weir plate is moved to a different position. The larger the separator weir, the more this problem is magnified. Mercer also employs ergonomic adjustment handles on each side of our larger weir plates for ease of weir plate adjustment. 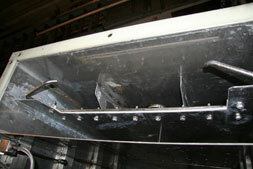 The weir plate and all associated hardware are inherently corrosion resistant. 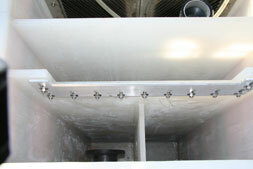 Standard units have 304L or 316L stainless steel weir plates and hardware. Gaskets are of either Nitrile or Viton depending on the wastewater characteristics. The weir plates are precisely manufactured by laser and are of a heavy duty design. 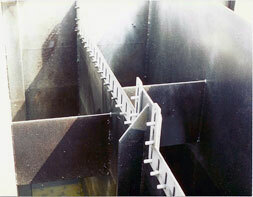 Other Designs: Most other designs do not utilize a full-width weir plate. Others supply simple outlet invert pipes that create unwanted surges within the separator. Typically, OWS manufacturers that incorporate weir plates supply painted carbon steel weir plates and plated hardware. Most manufacturers use steel of the same thickness of the tank which helps create binding problems and issues with weir leaks. Few manufacturers supply inherently corrosion resistant weir plates and hardware (marine-grade aluminum and 304 or 316 stainless steel). Plated hardware, in lieu of inherently corrosion-resistant stainless steel, will quickly corrode in the wastewater environment. Many manufacturers also utilize less expensive gasket material that will succumb to various hydrocarbons, chemical contaminants and high temperatures. No other separator supplier offers a weir plate design with bolt hole centers at 4 - 4 1⁄2”, allowing ease of adjustment and hydraulic sealing with only tightening the hardware "finger tight". By having the nuts every 4 - 4 1/2" there are more "points" of pressure over the entire weir plate for sealing, and therefore less torque per nut is required for a positive seal. With a low-torque weir design, there is no deformation of the weir gasket and the weir plate will be able to be reset in the future without the issues of resealing the weir plate due to a deformed gasket. NOT ALL OIL WATER SEPARATORS ARE CREATED EQUAL. 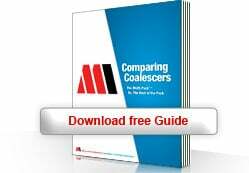 Download our free guide to comparing coalescer designs.